Are you looking for the best selection offered among all of the carpet shops Bournemouth has available? Whether you are interested in the latest designs or traditional options, Dorset Contract Flooring will have the perfect flooring solution for you. Visit our showroom or give us a call on 01202 300 700 to discover more. We are always here to help and look forward to hearing from you very soon. Here at Dorset Contract Flooring, we offer a superb selection of high quality carpets that you will absolutely love. From twists and berbers to plains and natural textures, our Bournemouth carpet shops have something available for everyone. If you prefer to browse carpet shops Bournemouth offers yourself, then you can visit our showroom. Our dedicated sales staff would be delighted to listen to your requirements and show you all of the available flooring options that will perfectly match your needs. You will also be able to borrow individual samples or a range of colours as a basis for your new interior. As a company, we strongly believe in fair pricing. You will always get the highest quality product at a very competitive price that won’t break the bank. Our carpet shops in Bournemouth also offer discounts when you purchase a full roll. Quality underlays will be guaranteed for the lifetime of your carpet. On top of being the leader among carpet shops Bournemouth offers when it comes to supply, Dorset Contract Flooring also offers a professional fitting service. Before you commit to a purchase, you will get a full quotation for everything with no strings attached. Free measures and estimates will be provided to ensure that you are getting the best solution for your unique needs. Would you be interested in seeing our carpet shops Bournemouth first hand? We have several high resolution images of our showroom available to view in our virtual gallery. You will also find pictures from successful past projects that our professional installers have completed. At Dorset Contract Flooring, we have over 15 years of experience in supplying and fitting high quality carpets and flooring. Domestic and commercial customers alike have come to rely on our expertise and fantastic prices. If you ask any of our previous clients: “Who is the leader among carpet shops Bournemouth offers?” they would not hesitate to point you in our direction. With carpet prices starting at £4.00 per square metre and cushion floors at £5.00 per square metre, you can rely on our carpet shops in Bournemouth to offer cost-effective solutions. These prices combined with our customer service skills and great aftercare solutions are what has made us the go to company in the area. 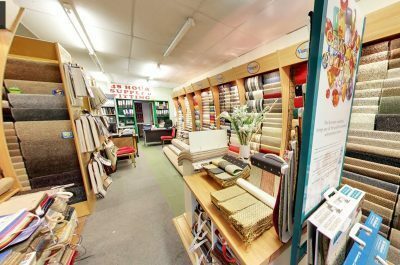 Our Bournemouth carpet shops are popular among many local businesses as well as domestic clients. Numerous Dorset hotels, pubs, hospitals, and office buildings have purchased our products in the past. We also offer carpet cleaning services for interested clients, so get in touch with us for more information about this option using one of the methods outlined below. Have you decided that Dorset Contract Flooring is indeed the top choice among carpet shops Bournemouth can offer? If you have, contact us now. You can reach out to us by either calling 01202 300 700, e-mailing info@dorsetcontractflooring.co.uk, or filling out our simple online enquiry form. We’ll respond to your enquiry very shortly.